Mix shredded chicken, buffalo sauce, shredded broccoli, and onion. Set aside. Layer 2 pieces of phyllo dough on top of each other and spray generously with cooking spray. 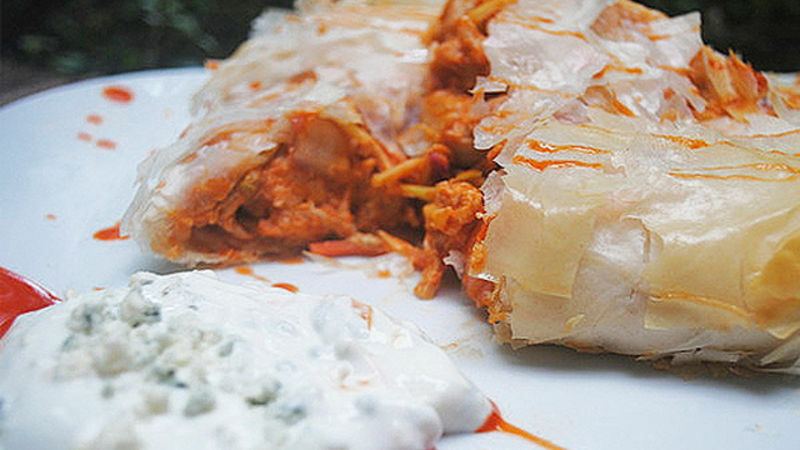 Place chicken mixture on the phyllo dough and top with 1/3 cup blue cheese. Then top with the remaining two pieces of phyllo dough and spray again with cooking spray. Roll the sandwich up and tuck edges under. Brush top with melted butter. Bake wrap in oven for 12 and 15 minutes until golden brown. Remove from oven and cool slightly before slicing into two portions and serving with the dipping sauce. DIPPING SAUCE: Mix yogurt, lemon juice, and garlic together and blend well. Add 1 tsp blue cheese crumbles and mix. Add more cheese to taste if desired. Hot and spicy with a cool blue cheese sauce, is an absolute favorite guilty pleasure for eating when watching the big game, or just straight up chillin’. They’re so good that you almost think they can’t be improved. But maybe we can get the buffalo wing taste in another delicious fashion? Let’s review. Improving the famous buffalo wing? No. Replicating the flavor by creating another delicious, chill-worthy entrée? Yes. Hot and spicy with a cool blue cheese sauce, is an absolute favorite guilty pleasure for eating when watching the big game, or just straight up chillin’. They’re so good that you almost think they can’t be improved. But maybe we can get the buffalo wing taste in another delicious fashion? Let’s review. Improving the famous buffalo wing? No. Replicating the flavor by creating another delicious, chill-worthy entrée? Yes.